This resource is a guide to help our partners really understand the attitudes, behaviours and preferences of young people and to gain an understanding of the differences between young people – their mindsets, lifestyles, their quirks and concerns. Young people have complex relationships with sport and physical activity based on their unique personalities and experiences, this Z-Card shows the several personalities to give more understanding into a young persons mind. This resource encourages you to be creative and provides thought on how to make your session unmissable. Drawing on recent research it contains fun ideas and tips for coaches. This resource gives advice on how you can help young people deal with change and uncertainty. Guide for coaches showing how everyone has a different motivation for taking part in sport, with session plan ideas for you to try. Energise me, We commissioned The Behavioural Architects to delve into the lives of inactive teenagers living in Hampshire and the Isle of Wight. The Behavioural Architects’ mission was to develop quality local insight that would help us understand young people’s habits, motivations and barriers to being active. 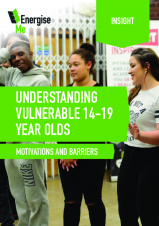 The guide, Understanding Vulnerable 14-19 Year Olds, summarises their findings and can be used to help shape activities for this audience.